Chrome in Ubuntu is not rendering Urdu fonts properly. It is showing gibberish characters I'm not able to read. The problem is especially bad on Facebook. I copied some Urdu fonts under ~/.fonts and under /usr/share/fonts/ and updated the cache and then restarted Chrome but even that didn't work. I have installed MSCore fonts and many other fonts but it's still not working. Download and install nafees-urdu fonts. and refresh your browser. This works fine for me. Go to twitter or facebook or any other site and left click the extension. Use custom settings and select tahoma. Click ok and then refresh the page. I think the problem is that Ubuntu does not have unicode Arial fonts. I just found a solution that is working well on Facebook . First you need to install 'nafees fonts' for Ubuntu. 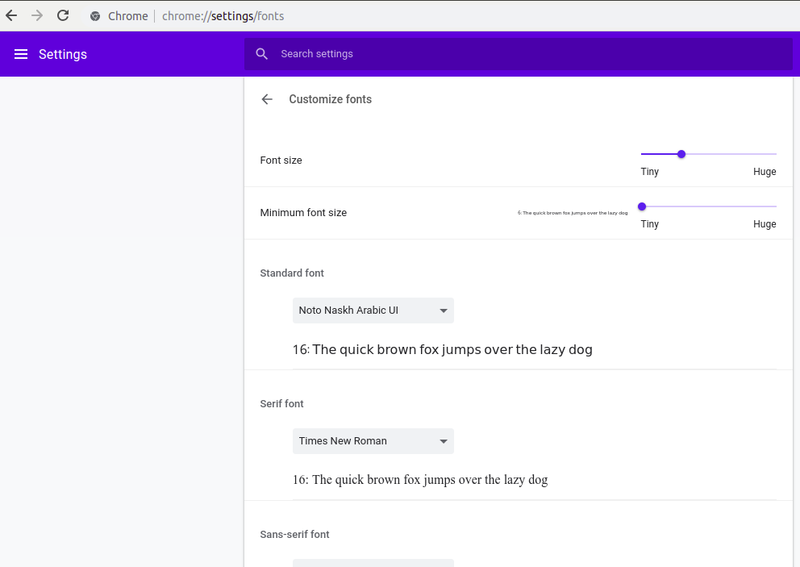 Get the Chrome extension "change font family style" from Chrome store. Go to the extension's option. Click save, then close the window, and refresh the facebook page. it should work. Not the answer you're looking for? Browse other questions tagged google-chrome fonts or ask your own question. How Can I Get Urdu Fonts? Why can't I install fonts system-wide? How do I stop one of my installed fonts from overriding other web fonts?